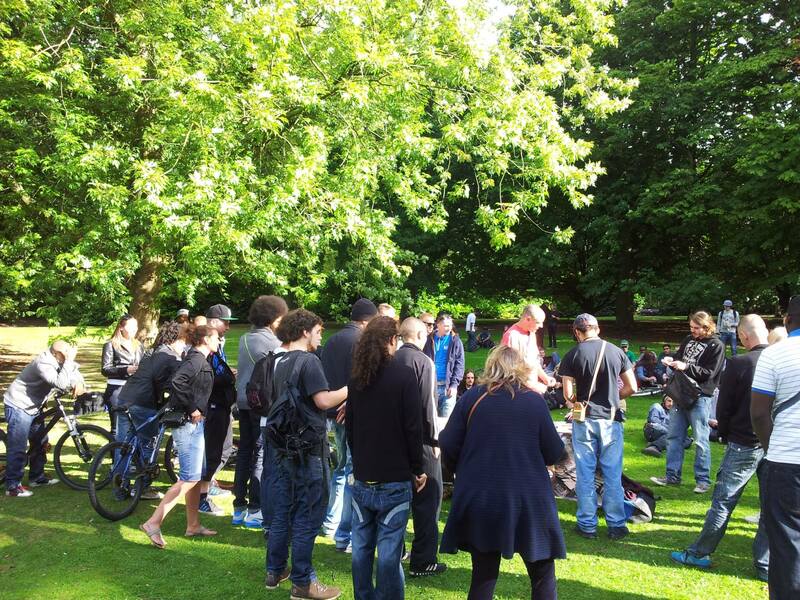 Birmingham Cannabis Club held a protest at Cannon Hill Park on Saturday 31st of August in opposition to the current policy that criminalises cannabis consumers. 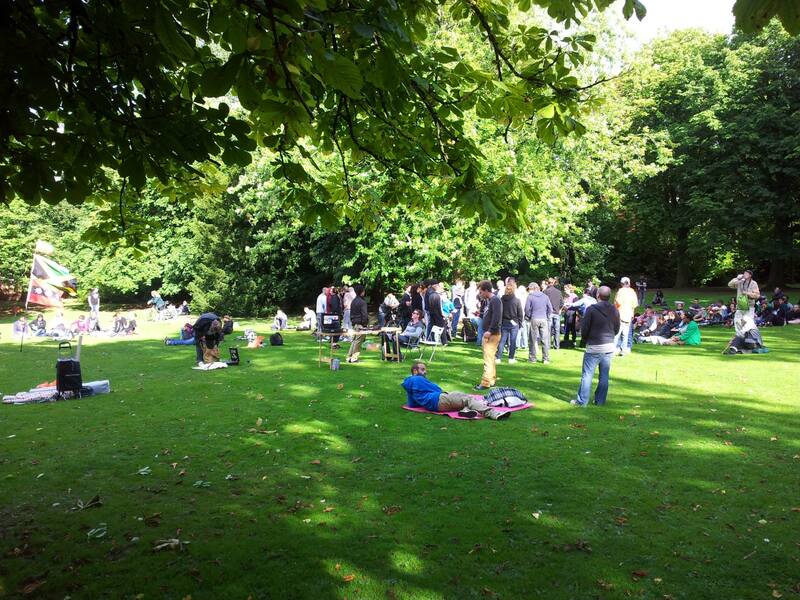 It was the largest UKCSC event this summer so far thanks to those that turned out to show support. 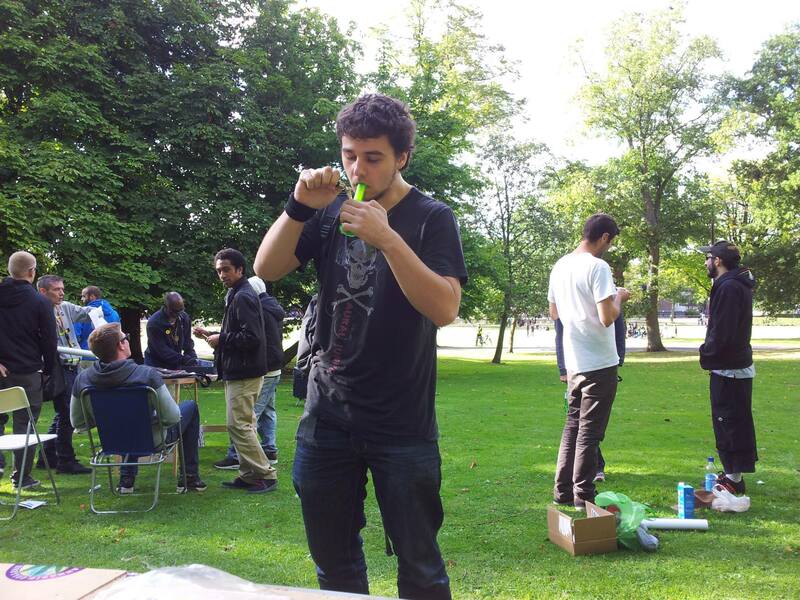 The event attracted local media attention in the lead up; the Birmingham Mail ran a story covering the history of cannabis protests in Birmingham which had always been single figure turn outs – once only one person came. This Saturday was much different however and more than 20 people were there before the official start time of 1pm. Even Osbourne who is still running the Birmingham branch of the LCA came in full décor with his Jamaica, Amsterdam and Jack Herer flags on a tall poll. You could see us quite well by now. Thanks to an hour long interview on BBC West Midlands radio where I was able to take calls from the listeners, the numbers seemed to keep increasing throughout the day. By 2pm there were already 100 or so people gathering and at 4:20pm there were just over 200 people waiting very excitedly to light up…again. There were lots of families in the park going about their normal Saturday activities and next to us on the bandstand there was the Punks in the Park Annual Picnic. Upon arrival at the park we were approached by the park warden and informed that we would not be able to put up a gazebo, play music or hand out promotional material as performance and event licenses were needed which we did not have and would have needed a few hundred pounds for. They did say that they did not have a problem with us using the park or being there and that they knew what we were doing. Besides not condoning law breaking, they were happy as long as we did not upset anyone else. I then asked PC Collis to explain the full procedure when stopping and searching someone on the grounds of being suspected of breaching section 23 of the Misuse of Drugs Act 1971. He ran the 8 of us admins through the three strikes process, and said it is first a verbal warning, then a written one along with what has now gone up to a £90 on the spot fine and ticket. Then if you are caught a third time you will be arrested. I requested to know if the threat of straight up arrest was based on the fact that we had been warned prior to the event so official procedure was not needed to be followed but we failed to get a clear answer on that.Very shortly after, a police officer who patrols the park and has done for 7 years cycled up to us and told us quite bluntly that they would be present in the park and if they smelt cannabis being smoked or saw anyone with it they would search them and arrest them if they were found to be in possession of anything illegal. 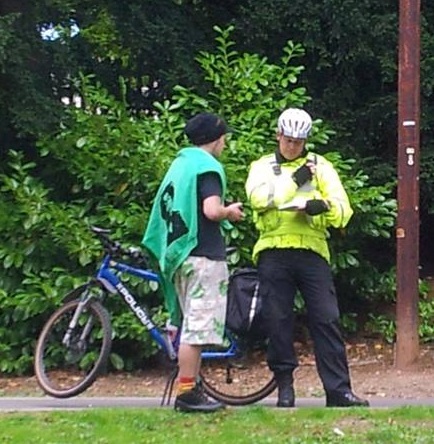 He said that too often people think they can smoke a joint while riding or strolling through the park and he had made about ten searches the week before. After 2pm there were two policemen in high-vis with bicycles stood right at the front of where we had gathered and two female officers, again in high-vis, patrolling the perimeters. Several police cars drove round the park intermittently and we were told that there were between 2 and 5 serial vans with riot police waiting if things got out of hand. By out of hand they meant that they were concerned that via social media and text messaging too many people would turn up. This says loudly to me that they are aware of just how many people smoke cannabis in Birmingham, which is probably way above the national average of 10% leaning closer towards the 50% mark. It probably hadn’t helped that the Birmingham Mail announced that we were smoking up outside the police HQ training facility ‘Tally Ho!‘ a bit further down the park from us. I assured the Sergeant that was in attendance throughout the day that this was not our intention and was simply a coincidence. Since we had been advised by the police that visible or ‘smellable’ cannabis would result in arrest you can imagine that we gave out that information to those turning up. As you can also imagine, a lot of people were very reluctant to light up in front of the uniformed presence we had there. This did not stop everybody though and before long a few had lit up, followed by a few more (discreetly at first), until the numbers gradually rose and the atmosphere became far more comfortable and hazy – safety in numbers clearly being key. 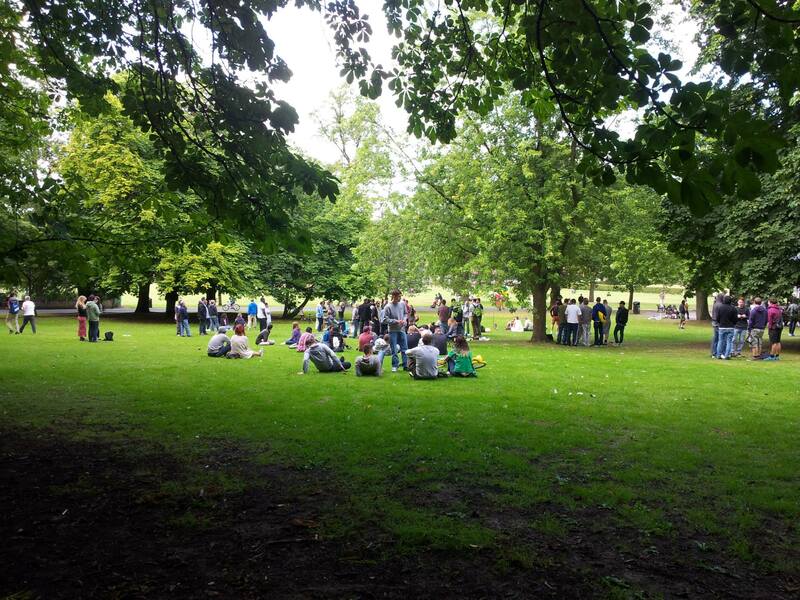 At around 3pm one of the police with a bicycle took a little roll round the edges of the gathering and as he got to the back, I saw him dismount from his bike and single out a man in his early 20’s sitting with his family and friends. This ruffled the feathers of at least half in attendance and a bit of a crowd had started to gather with lots of advice being given to both the suspect and the officer – who was not keen on being told the law. We kept everyone’s frustration at bay and in the end after a 15 minute chat the officer and cannabis consumer shook hands and parted ways – no personal information given and no fine. 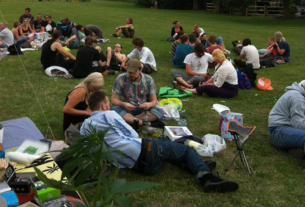 There were quite a large number of patients that had come out specifically for the event and were keen to explain to people (including the police) face to face, one on one how cannabis helps treat their symptoms when other prescription drugs don’t; and how prohibition is effecting and damaging their lives. One patient with fibromyalgia made it out to the protest for just 45 minutes before she had to go home because of her symptoms. To me that showed true courage, to firstly get out of the house and support something you believe in; and to do it out in the open in front of police, even when it is physically painful for you to do so. The aim of these protests is so we can justifiably argue that we need and should not be prohibited from having somewhere safe and out of the way of the public to socialise and medicate with other people within our culture. Without music we were concerned that there would not be the same vibe that we had planned on but it was no problem at all; there was more group to group interaction at this gathering than the ones I’d attended earlier in the summer and this kept the atmosphere at a good positive level. The high-visibility of the police probably did deter some people from coming over to join in. There were quite a large amount of people that came over, hovered around for a while at the back and, when they were sure that it was OK to light up, pre rolls were slid out or sly skinning up commenced. It must have been an extra sweet joint for some people. A ceremonial spliff to honor the step forward in our progress this year. For me the day was made by the conversations I had with the police. Sergeant O’Kieffe really took the time to listen to what I and others attending had to say, and Jo Martin, Deputy Director of NORML UK gave all four officers on duty NORML UK wristbands which they wore all day. It was great to have the opportunity to have a real talk with a real person that deals with cannabis and cannabis consumers on a weekly basis because of his job. I explained that we are on the side of the Police. We do not want our tax money spent putting their lives in danger. We do not want them to have to break into booby trapped grow houses run by dangerous criminals and we as the consumers of cannabis do not want people like that growing it or making money from it, and we certainly don’t want to be giving our money to them to buy the product. Gangs do not care what they are pushing as long as they get the money and they don’t care what the age of the person they are selling to is. 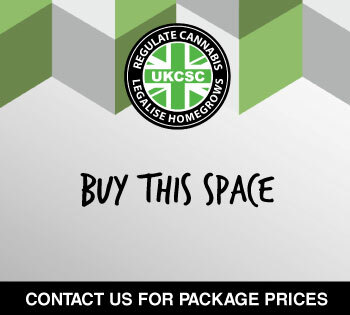 Cannabis Social Clubs would implement strict age regulation, not be linked to organized crime, label the products, inform and educate the consumers/club members on the available products and provide a place out of the way of young or vulnerable people for those who consume cannabis to socialise. We demonstrated that we don’t get rowdy or violent, that we are normal people and we just want the same respect that coffee or alcohol consumers get. The biggest worry that there was for the police force was the alarm to the public and it being in such close proximity to children. 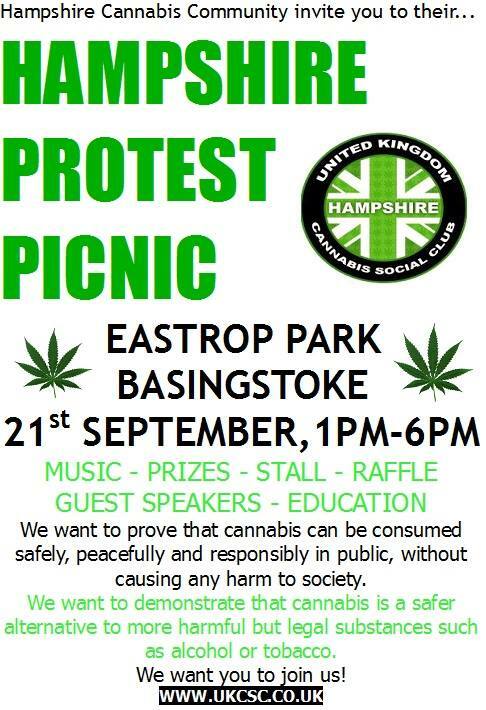 Yes, some people may have agreed that choosing a family park for a cannabis event would not be appropriate, but we are just trying to show we are normal like anyone else and we shouldn’t be forced to hide just because others do not like it. Last month down the road in Worcester was the largest beer festival in Britain, right where I like to go every weekend – I’m not a beer drinker so I went to a different part of the park. Just because I do not like beer does not mean I should be against others that choose to consume it – as long as they don’t start affecting my happiness or personal space. I would hope that this is how the wider public can start to accept cannabis. I do think it is starting to swing our way. Seattle Hempfest was also just a few weekends ago and that pulls in 400,000 hemp and cannabis lovers every year. It is held in Seattle Waterside Park and it is one of, if not the biggest family event in the state. Children are around cannabis (now a legal drug in the state of Washington) and it can be taught to children by good example and education that cannabis is an adult thing, like beer is. Being able to explain this information to the Sergeant while pointing out that some people did bring their children to the event helped ease his concerns a little and bring things into perspective; parents do use cannabis too! 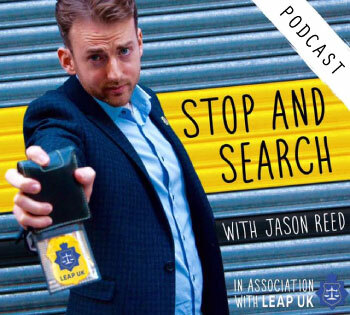 He let me know that several members of the public had asked what was going on and when he had explained they were fine about it because they felt safe knowing that it was under control, although at first concerned because of the illegality, and therefore stigma, around cannabis possession. Lastly, we had a short discussion about cannabis cultivation and the scale that it is done on. I compared the way things are here with criminals stealing electricity in warehouses on industrial estates to the legal industry where they rent them out to cannabis growers who pay for the electric and employ dozens of people to work there, who all pay tax on their income and aren’t criminalised for doing what they would be criminalised for doing here. I pointed out that I had even worked in an indoor garden in Colorado the same size as the space we were occupying, and that my friends who work there are able to help people stop having seizures and heart conditions and are even treating peoples cancer successfully. We shook hands and thanked each other for the mutual respect throughout the day and for allowing and respecting our right to protest peacefully. I took the last breath just to explain that the reason there is tension between cannabis consumers and the police is simply because we are fearful that we are going to be singled out and treated differently for using cannabis, when we have shown that it isn’t actually a bad thing or something to worry about policing. He pointed out that it was because of the law that we would be singled out, and I said that it’s a shame that it was creating such a barrier in society that is unnecessary and making their jobs harder. If up to 50% of the population of Birmingham had more trust and respect for the police just because they weren’t going to get nicked for cannabis I can’t see how that would be a bad thing…and look at all the extra time and resources the police would have to solve real crime. Both police and CSCs are against organised crime and for protecting the young and the vulnerable. 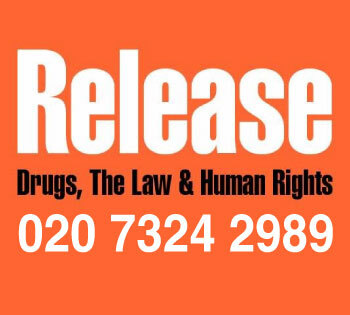 Organised criminals only care about themselves and exploit the young and the vulnerable for profit. We have a safer, more respectable and proven model. So let’s hit the gangs where it hurts! Original Dampkring. Lemon Skunk – Amsterdam Coffee shop Cannabis Review. If you do then drop me a line and let me know. All these gatherings seem to be in the south which is a bit far to go to stand up for our Rights on this plant.